The talented MacBook General pane determines the look and operation of the controls that appear in application windows and Finder windows. It looks complex, but each option is explained here. Appearance: Choose a color to use for buttons, menus, and windows. Highlight Color: Choose a color to highlight selected text in fields and pop-up menus. Sidebar Icon Size: Select the size of the icons in the Finder window sidebar — that’s the strip to the left of the Finder window that displays your devices and favorite locations on your system. If you have a large number of hard drives or you’ve added several folders to the sidebar, reducing the size of the icons will allow you to display more of them without scrolling. Click in the Scroll Bar To: By default, OS X jumps to the next or previous page when you click in an empty portion of the scroll bar. Select the Jump to the Spot That’s Clicked radio button to scroll the document to the approximate position in relation to where you click. Ask To Keep Changes When Closing Documents: If you select this check box, Mountain Lion prompts you for confirmation if you attempt to close a document with unsaved changes. If the check box is deselected, Mountain Lion will allow the unsaved document to be closed without saving a new version. Close Windows When Quitting an Application: If this check box is deselected, Mountain Lion’s Resume feature automatically saves the state of an application when you quit. When you launch the application again, Mountain Lion restores all application windows and opens the documents you were working on when you quit. In effect, you can continue using the application just as if you had never quit. If you select the check box, Mountain Lion will not restore your work, and you’ll have to load your document again; this is the same action taken by versions of OS X predating 10.7 (Lion). Recent Items: The default number of recent applications, documents, and servers (available from the Recent Items item in the Apple menu) is 10. To change the default, open the pop-up menus here and choose up to 50. 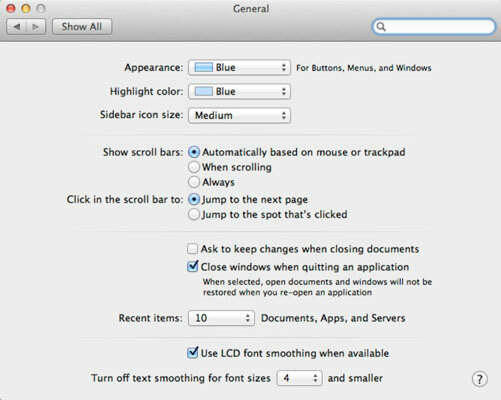 Use LCD Font Smoothing When Available: By default, this check box is enabled, making the text on your MacBook’s display appear more like the printed page. You can turn off this feature to speed up text display slightly. Turn Off Text Smoothing for Font Sizes: Below a certain point size, text smoothing isn’t much good for most on-screen fonts. By default, any font displayed at 4 point (pt) or smaller isn’t smoothed, which is suitable for a high-end video card and monitor. You can speed up the display of text by turning off text smoothing for fonts up to 12 pt.